I can’t remember the last time I took an actual vacation (weekend trips don’t count). This Monday evening, I’ll be jet setting down to Buenos Aires for a week of shopping, hunting and feasting. On Tuesday, we get to have coffee with the Ambassador at the US Embassy in BA! 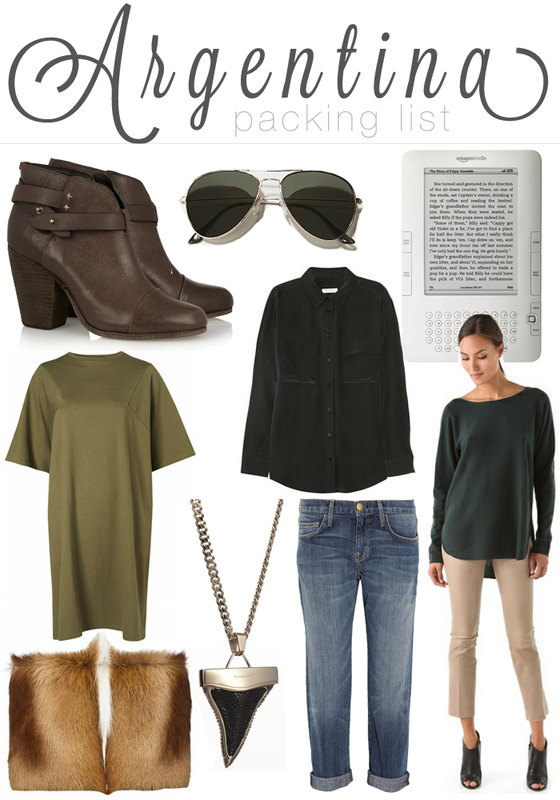 Stay tuned for lots of photos and hopefully quite a few outfit posts… Here are some of the items I am packing for the trip! You will love BA! And Cordoba is very charming. I can’t wait to see photos of your trip! Love this effortless city safari vibe. Seriously, those are some great pieces. Have a wonderful time on your trip, sounds very exciting! wow! sounds like you have a fabulous trip planned… and I know you will be traveling in high style!